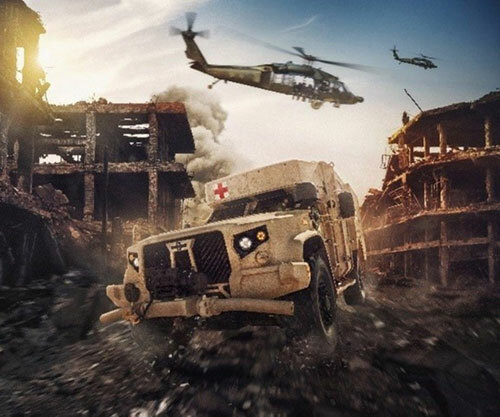 Oshkosh Defense, LLC, an Oshkosh Corporation company, is showcasing for the first time its L-ATV Ambulance at the Association of the United States Army (AUSA) Global Force Symposium in Huntsville, Alabama, from March 26-28, 2019. “The L-ATV Ambulance is the next generation of ambulance vehicles, designed specifically to protect wounded Warfighters without sacrificing the speed and mobility needed to keep up with JLTVs on the battlefield,” said George Mansfield, Vice President and General Manager, Joint Programs. “In addition to its ability to protect and maneuver with the JLTV in combat operations, the L-ATV Ambulance has the flexibility and payload capacity medics required to transport life-saving equipment, allowing them to safely and efficiently perform their operations on the move,” he added. With the L-ATV Ambulance’s powerful drivetrain and TAK-4i® intelligent independent suspension system, the vehicle can travel off-road at JLTV speeds while the vastly improved ride quality enables medics and corpsmen to render medical aid while transporting the wounded to combat support hospitals.